Even though it still feels like summer around here (anyone else ready for some sweater weather? ), there’s no denying that the holidays are well on their way. ‘Tis the season to carve your pumpkins, plan your Thanksgiving menu and think about holiday cards and gifts. Those who just want to update their family photo every year to send out cards, have a keepsake remembrance of Sally with her two front teeth missing and some convenient gifts for the grandparents often take advantage of my annual holiday mini sessions. This year I am even having a set of pet mini sessions exclusively for your fur babies, held on Nov. 14th at the Muttropolis store at Fashion Island in Newport Beach. But what if you aren’t available on one of the mini session dates? Or you have family coming into town for the Thanksgiving holidays? Or you just want to have a little more of a custom experience – one where you can pick your own date, and your own location – and still get a great package deal that includes everything you want and need for the holidays? Well the good news for you is that during the month of November only I am booking special holiday mini sessions. 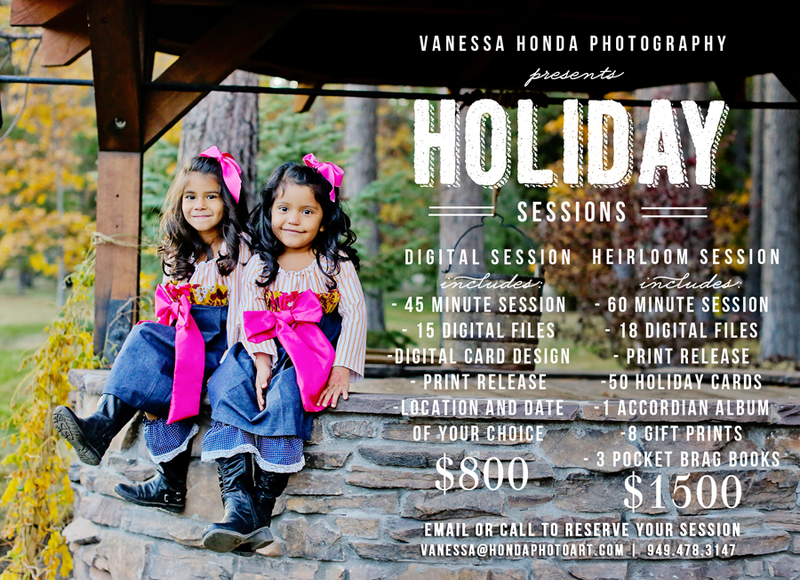 These smaller holiday sessions can be totally customized to your needs. I’ll help you find the perfect location for you – whether that be at your home, the studio, a favorite park that has meaning to you or the beach grandma took everyone to when you were all little. There are two package to choose from; both include the session + digital files. The Digital Session is for the DIY-ers out there – those who want to make their own prints and gifts. The session is 45 minutes long and includes 15 digital files for $800 – at a huge discount from the regular price of $220 for the session and $150/each for digital files. The Heirloom session is for those who don’t have the time to do it all themselves…or more likely, know that those files will sit on a USB drive in their desk drawer for years if they don’t have something done with them. This package includes the session, 18 digital files, 50 press printed holiday cards, 1 Accordian book (7 pages with full color cover), 8 gift prints ready to give for the holidays and three pocket albums – two for the grandparents and one for your purse or desk! Save more than 50% off of normal a la carte prices!